After a long day of trudging through snow, work and a post-holiday grocery shopping trip, I didn't have much motivation to do some intricate designs or stamping on my nails. Luckily, my Lacquistry was waiting for me to open it at lunch! 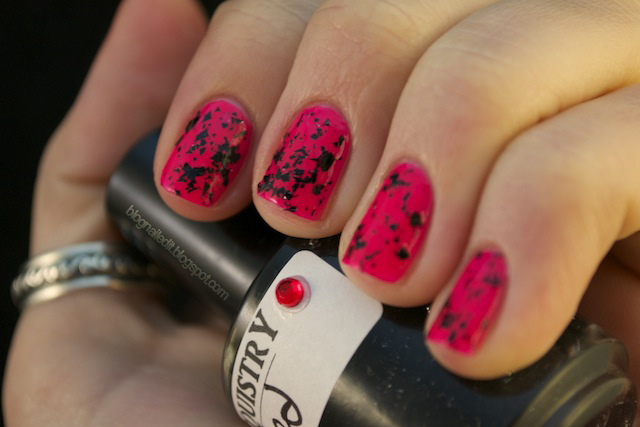 I first saw polishes created by Jenna at Lacquistry at Amy's blog, and in particular, this post. Still striking out in getting any Lynderlla polishes, I fell in love with Jenna's Shredded collection. I snagged the black, gold, and aqua versions of the shredded polishes and holy spicoli am I pleased with them! Not only for their reasonable price ($7.50 a bottle), but also for their...well let's just let the pictures speak for themselves. I needed the black because it's dying to get some serious contrast (which you'll see in a moment). I also grabbed the gold, mostly because I was upset when I applied Essie's As Gold as it Gets only to find out that the gold flakes didn't actually remain gold once they were layered. And of course, the aqua was too unique to pass up. I also picked up a polish she aptly named Potting Soil. You'll see that in the future though. So, a quick mani later, I got these neon results. I reiterate...holy spicoli! 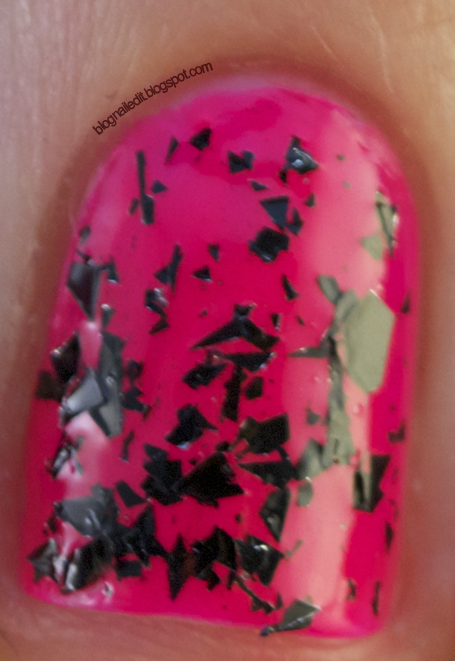 Slapping the black Shredded on top of China Glaze's Pool Party is probably too much to handle for some, and definitely a driving hazard if nothing else, but it's so beyond effortless-awesome that I think even those of you who don't favor pinks and neons will give it its due credit. Thank you so much Jonochi! I've updated my "Awards and Mentions" with the award. I'm glad you think my blog is cute, but I may change it soon. It'll still be awesome! Also, if you hadn't noticed before, I enjoy making other blogs' headers cute as well! Check out my page, New Follower Gift for more info. I NEED this!!! Very pretty. 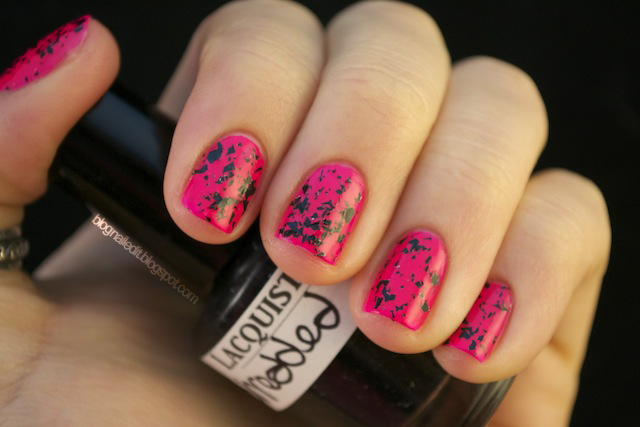 This manicure is really really lovely! I must say that Pool Party looks gorgeous on you, because it looks so orange on me! Love! You know, there's a funny thing about that. When I snapped the pictures, they appeared super orangey-pink on my LCD screen of the camera. Then I upload them, and they lose that highlighter touch a bit. They're still gorgeously bright, but there was a transition between camera and computer that changed things a big. Not a pink fan-but that shredded looks really awesome!